Coverage is a major factor enhancing or limiting video service provider market share. In fact, coverage limitations are the biggest barrier to telcos taking more market share from cable operators. Cable TV companies operate in virtually every city and town in the United States. Satellite providers likewise cover nearly 100 percent of the surface area of the entire country. Telco TV providers do not yet have ubiquitous coverage, though where they do operate, providers such Verizon have gotten about 35 percent market share, where the cable provider might get 39 percent or 40 percent share, with satellite providers getting the balance of accounts of homes that do buy video entertainment. To be sure, AT&T and Verizon are now the fifth and sixth biggest subscription video entertainment providers in the United States, trailing Comcast, Time Warner Cable, DirecTV and Dish Network. Still, because telco TV is not ubiquitously offered, U.S. phone companies have about 10 percent market share, where cable TV companies have about 55 percent share, and satellite firms have close to 30 percent share. You might think the telcos have issues with content, marketing or retail packaging. That isn’t the case. The issue is coverage. By 2015, AT&T, for example, will be able to market to only about 33 million locations. Verizon’s FiOS covers about 17.8 million homes, so the two telcos will pass about 51 million U.S. homes, by 2015, out of perhaps 145 million U.S. homes by 2015. That implies coverage of about 35 percent of U.S. homes. Other telcos will sell telco TV as well, but collectively could only theoretically reach about 14.5 million homes, or so, by 2015, best case. Even under the best of circumstances, it is unlikely U.S. telcos will be able to pass even 45 percent of U.S. homes by 2015. That is one reason why some observers believe either AT&T or Verizon might eventually buy either DirecTV or Dish Network, or a combined entity, should the two satellite firms wind up merging with each other. That is the only way, aside from launching robust streaming video services offering virtually all the standard channels sold as part of a standard cable TV, satellite TV or telco TV offering, that a telco could achieve full national coverage. But changing customer habits and eventual content owner preferences are a wild card. Some might argue that today’s subscription video business is past its prime, and that streaming delivery is the future. If so, a distributor could achieve national distribution by using an over the top approach. And that might ultimately be viewed by a few telcos as the best way to proceed. Doing so would mean national coverage without the need to build access facilities, for example. With the important caveat that average revenue per account and profit margins are disparate, Netflix is, by at least one or two measures, bigger than HBO , and also is bigger than Comcast on one measure. Netflix is bigger than Comcast when measured by paying subscribers, and Netflix is bigger than HBO in terms of gross revenue and subscribers. Comcast is far bigger than Netflix in terms of average revenue per user, while HBO is vastly more profitable, in terms of profit margin. HBO probably has margins in the 33 percent range, while Netflix margin is in the five percent range. Also, Comcast has average account revenue above $80 a month. Netflix has average revenue per user of about $10 a month. Comcast third-quarter 2013 results showed the firm lost 129,000 video subscribers, ending the period with more than 21.6 million video customers. Netflix has about 30 million U.S. subscribers. Comcast also lost 348,000 video subscribers through the first nine months of 2013, as well. Comcast now has almost as many high-speed Internet subscribers (20.2 million) as video (21.6 million), and that business still is growing. Comcast gained nearly 300,000 broadband subs in the quarter. Some think the growing popularity of Netflix is one reason Comcast recently launched an antenna basic plus HBO package that offers consumers a low price and access to HBO, seen by some as a competitor to Netflix, in many ways. Comcast EVP Neil Smit says getting Netflix onboard its X1 platform, making Netflix an app on the set top box, "is not a high priority" for Comcast. "Our customers can receive Netflix in a number of ways, so it’s not really a high priority for us," said Smit. "We’re open to putting apps on our X1 platform. We have, for example, Facebook and Pandora there now." But at this point, Netflix does not seem likely to get such treatment from Comcast. Some might speculate that Comcast has designs for a streaming video service of its own, at some point, so that might explain some of the apparent reticience. Nor does Comcast want to use the Netflix content delivery network, either, said to be a condition for Netflix doing such deals. If you think regulatory scrutiny of AT&T’s effort to buy T-Mobile US was contentious, just wait until AT&T tries to buy either Vodafone Group or EE in the United Kingdom, a move that reports suggest is under active consideration at AT&T. AT&T reportedly also considered a purchase of Telefonica, but Spanish regulators quickly moved to signal disapproval. In recent days Mexico’s America Movil encountered opposition by an independent KPN shareholder group to its bid to buy the remainder of KPN it did not already own. Both America Movil and partner AT&T were rebuffed in 2007 in an effort to buy Telecom Italia, as well. Opposition could arise from national regulators, company poison pill defenses or independent foundations set up to ward off unwanted takeovers. Combined, Vodafone and AT&T would be the largest telecom firm on the planet, with a market capitalization exceeding $250 billion and large-scale operations in the U.S. and across Europe. That level of scale might be important to the firm as it explores new lines of business where scale is important, ranging from advertising to video entertainment, and probably also would help the carrier when negotiating with handset suppliers and other suppliers of infrastructure. Though AT&T might wind up not making a bid, it could not move before the closing of the Vodafone sale of its Verizon Wireless stake, expected in early 2014. Will Access Networks Lose Value in Mobile Business? Two decades is a very long time in the communications and application ecosystem. That is long enough to make a transition from “no Internet” to “dial up Internet.” A couple decades is enough time for Internet access to move from dial up to broadband, or from video-constrained to video-capable. Two decades also is sufficient time for value in the networks ecosystem to undergo huge change. Precisely what changes might occur remains to be seen. But it is not unreasonable for some to suggest that the relative value of core and access networks could change. Historically, both access and core networks were scarce. In the 1980s, core networks became less scarce, as firms such as MCI, Sprint and others built their own long haul networks. In the 1990s, access networks become less scarce. as mobile networks became more commonly-used assets. In the first decade of the 21st century, fixed networks became more common, and less scarce, as cable TV networks became communications networks and specialized metro fiber networks proliferated. In another couple of decades, might the value of access and core networks change again? Almost certainly, “yes.” The only issue is which changes will be most crucial for service provider business cases. What will the network of 2030 look like? More outsourced, more virtualized, more reliant on the value of spectrum as a “core competence” or source of value. At the same time, say analysts at iGR, it might be possible for competitors to pick and choose their underlying network resources choices further. Perhaps mobile virtual network operators will own their own core networks (long haul assets and application servers) while “renting” radio access. Think Google, Apple, Amazon or others with their own data centers, long haul transport and app servers. Each could rent radio access from a third party to provide the “last mile connection” to device users. That would something of a reversal of historic patterns, where many service providers owned their access facilities, and leased long haul facilities. That approach--owning the core network and leasing radio access, might also have other implications. As voice service providers often select termination facilities based on “best quality now” or “best cost now,” the future network could well employ dynamic access selection. When one radio access network gets congested, new style mobile virtual network operators might automatically shift traffic to different terminating networks, based on cost or quality parameters, much as long distance voice providers often do. In such a scenario, the “scarcity value” of an access network is lessened, with more value shifting the core network provider. The reason, in part, is further outsourcing of the actual radio network, not simply the tower sites, where mobile access becomes a purchased service, not an owned part of a network. That of course will prove financially beneficial for service providers of all types, but might be especially attractive to brands with core network capabilities that could be leveraged to create a new mobile service capability by renting wholesale access, especially on a dynamic basis. The extent to which that is possible will hinge on the degree of wholesale access to spectrum. Where today mobile virtual network operators rent “complete circuits and capabilities” from underlying network owners, in the future other possibilities might arise. Where today an MVNO might buy turnkey capabilities (voice, messaging, Internet access as complete wholesale offers) from an underlying carrier, in the future, it is possible that more virtualized networks would allow some brands with their own data centers, feature servers, billing and networks could simply buy radio access to create a full end to end service. For reasons that probably are intuitive, customer satisfaction tends to increase as the length of customer relationship with a particular product or service provider increases. Unhappy customers will leave, and therefore no longer register "unhappy" responses about a customer service operation. Also, the longer a customer remains with a particular supplier, the more likely it is that the customer will have learned how to use a product, and will have fewer questions about value, billing or "how to use the product." That is not to say the relationship between customer satisfaction and customer loyalty is especially direct. In many industries, even satisfied customers can churn at significant rates. That especially can be the case when the leading suppliers all offer comparable experience and value for money offers. In such cases, satisfied customers might well change suppliers for a relatively modest price advantage, for example. That is one "hard to quantify" advantage of customer loyalty. Customers with longer tenure tend to cost less to serve, aside from the likelihood that such customers also spend more than newer customers. The bad news for travel suppliers is that the reverse pattern tends to occur. Customers who have two years experience tend to rank customer service lower than when they were "new" customers. One might suggest there are reasons for those findings as well. There are relatively fewer things a travel experience supplier can do to make a customer interaction more satisfying, when the chief source of customer service inquiries have to do with something that went wrong. Clearly, seat comfort, meals and baggage fees also are issues. People are not generally too happy about those attributes of the travel experience, so the odds of unhappiness with customer service systems is likely to be weighted in a negative direction. So the caveat for service providers might be that experience with your product should, with longer customer tenure, lead to higher satisfaction with your customer service. That is, unless the core experience is not so good. In those cases, customer service satisfaction might drop over time, a reflection of general dissatisfaction with the primary experience of the product. A disproportionate share of customer contacts will be about cancelled flights, late flights, flight delays, lost reward program credits, redeeming reward program credits and billing issues, for example. There is a high probability that consumers will be interacting under conditions where they are unhappy. That is one reason why airlines tend to fare worse than other segments of the travel industry. Sprint expects to have Long Term Evolution 4G network coverage of about 100 million pops, using the 2.5-GHz former Clearwire spectrum (120 MHz in most major U.S. markets) by the end of 2014. That probabnly is less coverage than some observers had expected. But Sprint ought to be able to dramatically increase its LTE top speeds, once it activates the former Clearwire spectrum. In the 1.9 Ghz band, Sprint says it is seeing LTE provide 6 Mbps to 8 Mbps on a consistent basis. In areas where LTE now is avaialble on the 2.5 GHz band, Sprint is seeing 50 Mbps to 60 Mbps peak speeds. The difference is simply that Sprint can use bigger channels on the 2.5-GHz spectrum. Parenthetically, Sprint majority owner SoftBank saw its revenue jump 44 percent in the most-recent quarter, suggesting SoftBank will have capital to fuel an expected Sprint assault in the U.S. market. Sprint hasn't yet turned the corner on subscriber growth, largely, one might argue, because of lingering losses from its former Nextel business, but Sprint has managed to keep growing revenue, in its key postpaid "Sprint" business, for 13 or so quarters. In fact, a rational person might conclude that Nextel was the problem all along, as the Sprint side of the business has not fared badly. In most recent quarters, Sprint has added net customers even as Nextel has bled them. The biggest single hit came in July 2013, when Sprint shut down the entire Nextel network, losing about 1.3 million customers. 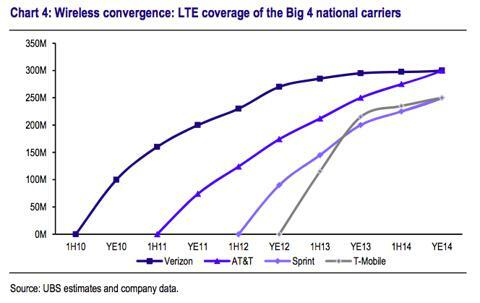 Still, going forward, Sprint without the drag of Nextel should surprise to the upside in the subscriber growth area. 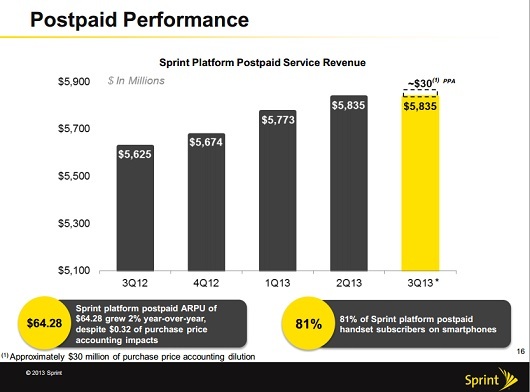 Granted, Sprint still is losing customers overall, and still lost money in the third quarter of 2013. But it is making progress, and has yet to unveil precisely what it plans to do with the now-consolidated Clearwire spectrum and SoftBank assets. Sprint owns the most spectrum of any mobile service provider in the U.S. market, a fact most observers expect will play a role in an anticipated Sprint assault on the U.S. market leaders. Some observers, though, will note there are advantages and disadvantages for the 2.5-GHz Clearwire spectrum. The higher frequency means signal reach is less than at 700 MHz and 800 MHz frequencies that Verizon Wireless and AT&T Wireless have in greater abundance. Signals at 2.5 GHz do not penetrate walls as well as the lower frequencies, either. In terms of network infrastructure, that lessened propagation distance means Sprint needs 13 to 15 tower sites, at 2.5 GHz, to cover the same area as a single 700-MHz macrocell. On the other hand, precisely because of the higher frequency, 2.5-GHz signals are capable of delivering more data, compared to 700 MHz or 800 MHz signals, using any particular coding technique. As a rough rule of thumb, 2.5-GHz networks, using the same coding, can deliver as much as three times to four times more data, using the same bandwidth as a 700-MHz or 800-MHz signal. But there are some new variables, including the tendency for users to consume as much as 80 percent of their smart phone or tablet data at home, when they are able to use fixed network Wi-Fi. Also, in some cases, as in dense urban environments, it might be quite feasible to use small cells or Wi-Fi to offload even much out of home data consumption. So except in rural areas where signal reach is a real advantage, Sprint might find its high-bandwidth network very useful in urban areas, which increasingly are seeing scenarios where small cells covering small distances are quite useful. At least in principle, Sprint might be able to use its trove of spectrum to provide the "fastest" service in many areas, if not perhaps ubiquitously across the country. The reason is simple: Long Term Evolution is limited principally by the amount of bandwidth allocated for it. Channels of 20 MHz provide much faster experiences than channels of 10 MHz, for example. SoftBank might also be able to bundle applications (especially video-related apps) with its faster access in ways that create uniqueness, much as Dish Network is expected to emphasize video entertainment as a distinguishing feature of its would-be LTE network as well. Virtually every banking-related or payments-related initiative in the United States has to begin with an understanding of how the U.S. market is different from others. The high use of credit cards, compared to most other markets, is one such distinction. The ubiquity of the banking infrastructure is another example. The way consumers pay for retail purchases is another key underpinning realities. Put simply, mobile banking is shaped by the fact that "access to banks" is not generally a problem. Nor, generally speaking, is "paying for retail purchases." So many would note one requirement for retail mobile payments success is adding new value to a process that is not fundamentally broken. Likewise, as ecosystem participants scramble to gain influence and control over the new processes, communication methods are seen as a way of gaining such influence. Some observers have confidence in near field communications, while others think other approaches might win the day. You can count Forrester Research senior analyst Denee Carrington as among those who are skeptical about NFC. Carrington says she does not expect NFC to ever takeover the mobile wallet space. NFC might well be crucial for other retail applications and experiences, though. Tom Wheeler has been confirmed by a vote of the U.S. Senate as the new chairman of the Federal Communications Commission. Some might complain about an FCC chairman who has in the past lead the major trade associations for cable TV and mobile communications. Others will say that probably is a combination of experiences that might prove exceptional useful as U.S. communications policy adapts itself for an IP-based communications environment that transcends historic regulatory boundaries, faces new forms of competition and calls for major investments in next generation infrastructure. The most important numbers in the global mobile service provider business are "three" and "four." The reason is that national communication regulators generally have held that four contestants is the minimum necessary to provide the benefits of competition for consumers. But in most markets, over the next half decade, there is likely to be significant consolidation in the mobile business, with many markets moving from four providers to three suppliers. That will be a serious issue for most regulators. Hutchison Whampoa Limited, for example, wants to buyTelefonica's 02 Ireland unit. The acquisition would quadruple the market share of Hutchison's subsidiary, 3 Ireland, to 37.5 percent, behind market leader Vodafone. The European Commission already has said it is concerned about a reduction of competition in Ireland, as the deal will cut the number of mobile phone operators from four to three. That was an issue Hutchison faced in its acquisition of Orange Austria in 2013 as well. Whether four competitors actually works "better" for consumers than three competitors remains to be seen. There are any number of inputs that collectively represent better consumer outcomes. Lower prices, innovative services and devices, higher speeds, more and better applications, many ways to buy and use, and more robust service all are parts of the value competition is supposed to deliver. You might instinctively argue that four competitors leads to lower prices, and that likely is generally true, at least in the short term. What is less certain is the longevity of such price benefits, over the long term, if the smaller contestants cannot stay in business. And that's the long term issue: capital intensive businesses might require high levels of investment on a continuous basis that a small competitor, competing on price, simply cannot afford to make. In that case, consumer benefit is less than it might otherwise be. Many observers might point to the inter-modal competition between cable TV operators and telcos as an example of significant competition and consumer benefits even when there are only two providers in a capital-intensive business. Others might counter that the history of intra-modal competition with just two providers, in the mobile business, suggests clearly sub-optimal benefits for consumers. So the key question is how widely regulators and anti-trust officials will conclude that reasonable and effective levels of competition can be promoted if a mobile market is lead by three providers, instead of four. Intel Media Preparing to End Effort to Create Sreaming Service? Intel Media has been trying to build a Web-based subscription TV service for several years, and originally had promised to launch late in 2013. But Intel seems not to have gotten traction with the content suppliers it would need to build a service analogous to cable TV. Intel recently had said it was looking for partners, including Samsung, Amazon, Liberty Media, and Netflix, but a report suggests Intel Media has failed at that effort as well, and is exploring a sale of its assets to Verizon Communications, which already owns part of the Redbox Instant streaming service operated as a joint venture with Redbox. Qualcomm earlier had launched a mobile video service called MediaFLO, but wound up closing the service and then selling the spectrum to AT&T after abandoning the effort. None of these failures is going to stop other entities from trying to create new streaming services. Sooner or later, a bigger crack than Netflix will appear in the dam. Aereo, the local TV streaming service, launching in Denver on November 4, 2013, already serves nine U.S. markets. Another firm, FilmON, previously "Aerokiller," operates in Western U.S. states, primarily. And Amazon, Apple and Google already offer video streaming content, if not perhaps on the scale of Netflix. And there is talk that Comcast might itself launch its own branded streaming service as well. So far, no provider has been able to convince a critical mass of content owners to make their shows available to streaming services on the same basis as presently offered to cable TV, satellite TV and telco TV providers. And that is to say nothing of new licensing models that might allow customized, individualized or a la carte purchase of single episodes, whole series or single channels. Sooner or later, it will happen, though most assume it will take some time to reach that point. It will likely take far greater disruption of the economics of today's subscription video revenues before content owners will be willing to start making changes that enable truly competitive streaming services. We aren't quite there, yet. 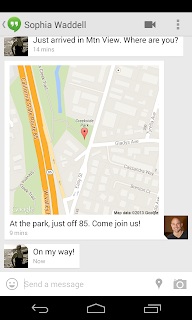 Google Hangouts and Photos have been enhanced. 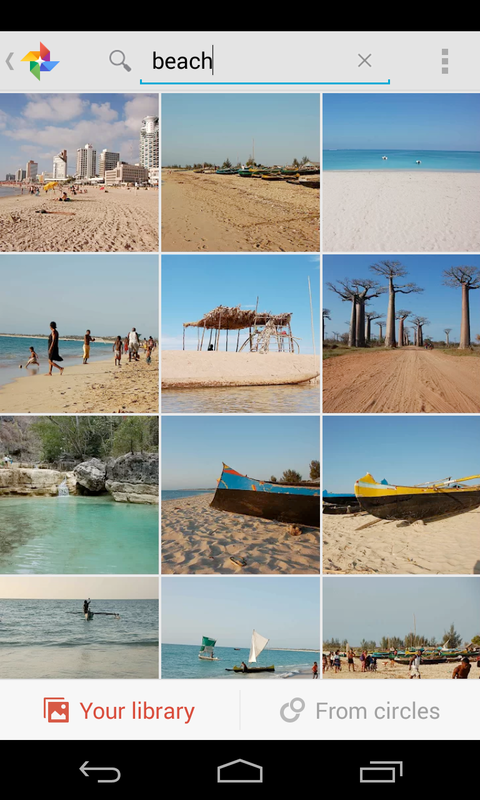 Google Photos already has been automatically backing up photos taken on Android phones and syncing to Google Drive. New are full size backups and background sync for Google+ on Apple iOS. 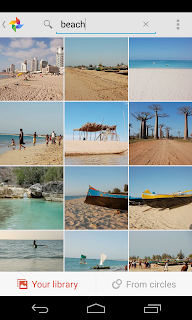 Google Photo now also recognizes and groups objects--over a thousand different objects at the moment--ranging from sunsets to snowmen, grouping them in user libraries. Auto Enhance improves each photo added to Google , and users can dial the enhancements up or down. If users already processing your images elsewhere, they can choose to exempt an album entirely. Google also has added editing apps. For editing on the go, use Snapseed and its new HDR (high dynamic range) Scape filter. More sophisticated editing can be done using Analog Efex Pro, part of the Nik Collection ($149). 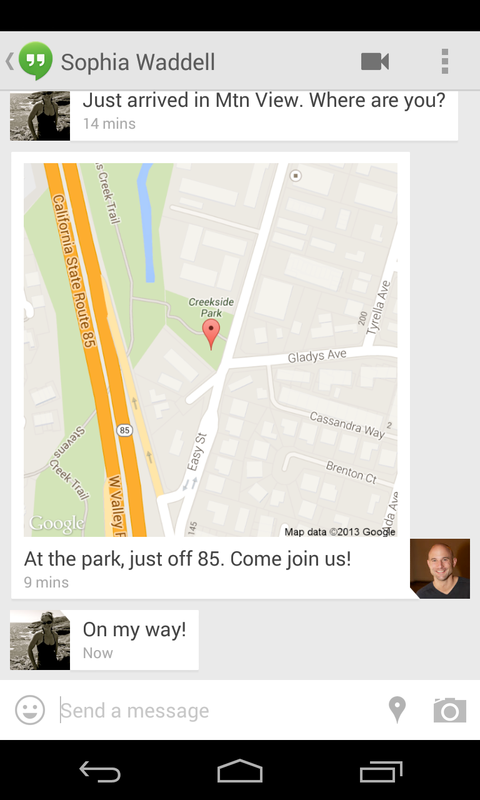 Hangouts for Android now supports location sharing and SMS. Users can send a map of their current location, send and receive text messages. Broadcasters can now schedule Hangouts On Air, then promote them with a dedicated watch page. Once live, Control Room lets users moderate the conversation with eject and remote mute. In both cases, the video calling experience is significantly improved, Google says. It's now full screen across mobile and desktop, and it fixes and enhances webcam lighting automatically. About 30 percent of tablets come equipped with mobile network capability. About 15 percent of tablets presently have a mobile data plan. That will grow. But between personal hotspots and home wi-fi, many do not need a separate data plan. Time Warner Cable, which upgraded its top Internet access tier in Kansas City, Mo. to 100 Mbps, is also upgrading customers in Lost Angeles to 100 Mbps. Residential customers in Los Angeles who subscribe to the Ultimate 50 tier are being automatically upgraded to Ultimate 100 at no extra cost. Ultimate 50 residential customers in New York City and Hawaii will be upgraded by year’s end. By early 2014, all customers in these markets will have access to Ultimate 100, with more TWC markets to follow in 2015.
Credit Google Fiber with the new incentives for Time Warner Cable to upgrade speeds. Spectrum is not the only cost input for a mobile service provider, nor is it the largest cost input. As a rule of thumb, operating expense might be in the range of 45 percent of revenue, while all network related capex might be in the range of eight percent of revenue. So spectrum acquisition costs are not a huge driver of overall costs, typically. What really matters is revenue. Still, the cost of spectrum matters in an environment where service provider costs threaten to exceed revenues earned from such spectrum. Depending on the country and the population density and terrain, a fully functioning 3G network, for example, might cost between several hundreds of dollars per customer, to a few thousands of dollars per customer. Spectrum costs are a fraction of that. Assume a service provider has 20 MHz of spectrum in an area of three square miles, paid for whether all of the capacity is being used or not (spectrum reuse is necessary to avoid signal interference). Assume people reached by signals from that one tower number cover three square miles, where the density is 600 persons per square mile. That implies a population of 5,400 people, each representing 20 MHz per pop. At prices of 10 cents per MHz pop, that works out to $2 per person, or $10,800 in spectrum costs in that area. At 33 percent market share, implying 1782 paying customers, the cost per customer is about $6 per customer. Even paying interest on such an investment is a small part of the total cost of providing service. But you can see the sensitivity to price per MHz pop. At $1 a Mhz pop, the spectrum would represent $108,000 in spectrum costs, or $61 per customer. At $4 per MHz pop, spectrum costs would represent $244 per customer. Amortized over 10 years, with monthly revenue of $50, that still is not unworkable, at reasonable market share. But as with any fixed cost, market share really matters. At 16 percent share, spectrum cost grows to about $488 per customer. If revenue earned from the leading services sold by mobile service providers is dropping, and if market share is fragmented, the cost impact of spectrum acquisition is magnified. In that sense, revenue per MHz pop, though not a metric anybody uses, likewise will drop. In the end, that is the key issue: revenue per MHz pop, not cost of spectrum per MHz pop, at a high level. Whether Long Term Evolution 4G auctions will become a spectrum bubble is anybody’s guess, at the moment. But industry observers with long memories will recall that vast overbidding nearly bankrupted leading European mobile service providers when 3G auctions were held. There are some signs of price inflation in the Netherlands, Ireland, Taiwan, in Austria and in the Czech Republic, for example. In Taiwan, bid prices were about three times what regulators set as the minimum price. The Czech Republic suspended its auction when prices grew too quickly. The U.K. 4G spectrum auctions generally are considered reasonable, compared to Czech prices before the auction suspension. The May 2013 U.K. auction raised around EUR0.18/MHz/pop. The Czech auction had reached EUR0.25/MHz/pop, about 30 percent higher than the actual U.K. prices. MHz per pop is a way of measuring capacity per person, and cost per megahertz per pop is a way of measuring spectrum cost, per unit of capacity, per person. Even that pales in comparison to 3G auction prices in some markets, where past prices have been measured in tenths of cents or cents. In some cases, Western European 3G prices were measured in dollars. Of course, the “right price” for spectrum hinges on any number of business and market factors. The value of Clearwire spectrum provides a recent example. Some recent 700-MHz spectrum in the U.S. market has sold for dollars per MHz pop, a “high” price by world standards. But that spectrum also has coverage and wall-penetrating advantages bidders believed justified the price. Whether spectrum was acquired at prices “too high” can be determined only after the capacity is put into service and revenue generated by that spectrum can be assessed. Prices of dollars per MHz pop might be quite reasonable if the new spectrum allows a service provider to gain customers, raise profit margins or gross revenue, cut churn or create uniqueness. In other words, 3G prices were an order of magnitude to two orders of magnitude above spectrum prices paid before, or after. To be sure, the value of spectrum generally is affected by the actual frequencies: lower frequencies are more valuable than higher frequencies. That is a function of signal propagation, not bandwidth potential. Signals at lower frequencies attenuate less, and hence travel further, with better ability to penetrate walls. On the other hand, signals at higher frequencies are capable of providing much more bandwidth, using any specific coding technique. Still, prices for 3G spectrum awarded in more recent auctions also was measured in the dollars per MHz pop. The 3G auctions in India provide a recent example. Also, some spectrum, licensed for backhaul applications rather than end user services, generally costs less than spectrum enabling actual end user services. For example, 3.5 GHz spectrum intended to support fixed wireless access applications, rather than mobile applications, often was sold at prices an order of magnitude less than spectrum for mobile apps. On the other hand, 2.5 GHz spectrum made recently available in many European countries (and Canada in 2004 and 2005) cost more than 3.5 GHz spectrum, but they are much lower than prices fetched in the 800 MHz spectrum band (which range between € 0.5 – € 0.8 per MHz-PoP in most countries). Looking at spectrum pricing in the higher spectrum bands, 2.5 GHz assets typically sell at a discount of up to 92 percent that of 800 MHz spectrum, while 3.5 GHz spectrum sells at around 82 percent discount to that of 2.5 GHz.